Another pedestrian was killed on Atlantic Avenue when a motorist struck a woman on the sidewalk. Gwendolyn Booker, 50, was walking on Atlantic near Schenectady Avenue last Friday at around 6:30 p.m. when a school bus driver mounted the curb, according to NYPD and published accounts. Motorists have killed at least four people on Brooklyn sidewalks in the last seven months. DA Ken Thompson charged none of those drivers for taking a life. The bus struck two light poles, a gas station, and smashed into several parked cars, in addition to striking the victim. Multiple news outlets reported that, according to unidentified police sources, a second motorist cut off the school bus driver, “causing” him or her to leave the roadway. Many reports used similar or identical language to describe the crash. None of those outlets — the Post, WCBS, WPIX, the Daily News, or WABC — apparently questioned their NYPD sources as to why steering onto the sidewalk was justifiable, how fast the bus driver was traveling at the time of the crash, or if the driver was distracted. Instead, the bus driver has been absolved in nearly all the press accounts because of a second motorist who hasn’t been located or publicly identified. The NYPD public information office had no other details about the incident. The bus driver’s name was not released by police, and no charges had been filed as of Monday afternoon. Booker was at least the fifth pedestrian or cyclist killed by a driver on Atlantic Avenue since last August, and the fourth Brooklyn pedestrian fatally struck on a sidewalk since last July, according to crash data compiled by Streetsblog. 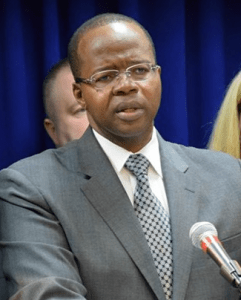 District Attorney Ken Thompson charged none of the drivers in any of those crashes for taking a life. Dangerous design makes Atlantic Avenue one of the most deadly streets in New York City. 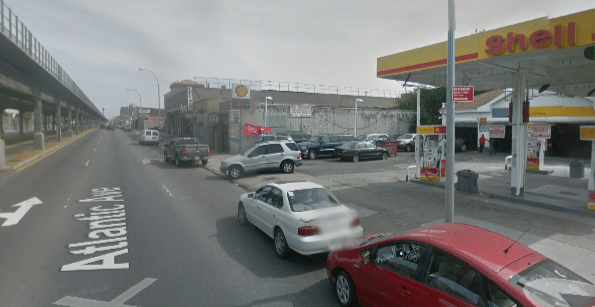 When a motorist killed Rodney Graham on Atlantic at Rockaway Avenue in January, Transportation Alternatives called on DOT to remake the entire corridor. As of now DOT has released plans for Atlantic between Georgia Avenue and Logan Street that would make minor improvements without altering the basic design of the street [PDF]. Design changes for a segment of Atlantic east of the first phase are expected to be released this year. The crash that killed Gwendolyn Booker occurred in the 77th Precinct, where local officers ticket between four and five speeding drivers a day, and in the City Council district represented by Robert Cornegy. Correction: Based on information provided by NYPD, this post originally identified the victim as Gwendolyn Brooks. Everyone has a part to play in #VisionZero. Let’s say for the moment this is true. In that case, the driver prioritized protecting the vehicles from damage at worst, or protecting the driver of the car that cut them off at best, over the life of the pedestrian. I bring this up because those attempting to design driverless cars are grabbling with exactly what choices to program into their software. I just hope that they don’t decide that if a vehicle has to hit something it should hit something soft — like a person. This is incompetent driving by the bus driver. If someone cuts you off, you are supposed to hit the brakes, not drive over pedestrians on the sidewalk. Might still end up hitting someone due to the energy of the crash, but at least there’s less chance of doing so. In general if you’re in a vehicle you want to go into a crash head-on or rear-on anyway, not side-on — the front and rear are where the crumple zones are. The photos on other website show a huge amount of destruction. The bus was clearly speeding and didn’t do much to try to break. I still don’t know how getting cut off can cause someone to lose control. Either you get hit or you brake. Unless there was severe mechanical failure, that bus driver needs to lose his license. Been trying to think of the right way to say this. I can’t believe we live in a world where NYPD sources shrug this woman’s death off like its an unstoppable act of God, or a victimless crime. Imagine being a parent putting your child on a schoolbus with a driver like this. I realize the Kitty Genovese story has been debunked to some extent, but the horror which with people view the bystanders to her death is one day going to spread to today’s NYPD and the ineffectual DAs. KILLER-LOVER Thompson needs to be voted out of office too.